The advantages and disadvantages of induction furnaces: known inductor with vertical electromagnetic flow and new (proposed in 2013) electromagnetic horizontal electromagnetic flow. A comparison of the key design and operating parameters of the melting process and furnace. Identified common and distinctive features. The use of furnaces of both types will expand the scope of induction melting. Keywords: Coreless induction melting, induction furnaces with vertical electromagnetic flow, electromagnetic furnace with horizontal flow. It is considering possibility of using Al-Cu-Ti complex master alloy for cast aluminum alloys, cuprous silumin as example. Microstructure and mechanical properties of alloy is comparing and also advantages and disadvantages of methods of producing. Keywords: Aluminum, master alloy, complex master alloy, microstructure, silumin, cuprous silumin. Based on the belief that the processes in the world, there are effective treatments, is its controlled change in the metal. Found that purging the melt with steam and preparing the alloys Al–20...40% Si in an atmosphere of water vapor have a strong modifying effect and reduces the thermal expansion coefficient at 50...150°C. The prospects of obtaining new light deformable high-silicon aluminum alloys of different purposes. Key words: Steam, Al–Si-alloys, thermal expansion, mechanical properties, melt processing. Discussed are low-alloy copper alloys and possibility of improving their processing properties by alloying them. Effect of addition of various elements on the improvement of their castability and scab formation has been studied. On the basis of reference information there has been conducted a statistical analysis of mechanical properties of bars made from lead brass of Russian grades, based on which their correspondence to DIN grades is established. There have been worked out and implemented in commercial scale manufacturing regulations for profiles from these alloys that are effectively used in machinebuilding industry. Key words: Lead brass grades, cold-drawn profiles, foreign customer, statistical analysis of mechanical properties, manufacturing regulations, output of commercial lots of products. A liquid-phase technology of making composite zinc alloys reinforced with intermetallide phases has been developed. A 10 to 12% lower friction coefficient and 85 to 90% higher wear resistance as compared to the matrix alloy ZA27 at adding 3.5% Ti have been established. 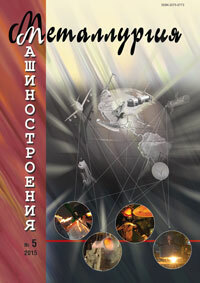 Key words: Сomposite zinc alloys, liquid-phase technology, tribotechnical properties. There has been discussed, technologically and economically justified, and implemented in practice the progressive trend of moving away from cost-intensive pressing and rolling processes and changing over to horizontal continuous casting of small cross-section stock intended to drawing semi-finished items in a wide range of grades and sizes that are successfully used in various spheres of machine-building industry. Key words: Wire and rod, horizontal continuous casting plant, continuous-cast stock, semi-finished products.